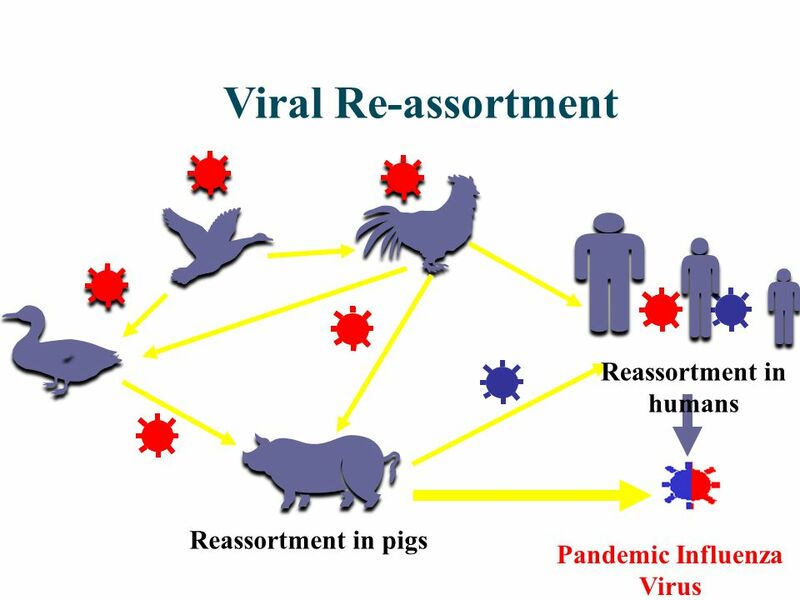 Type A (Seasonal, avian, swine influenza,….) 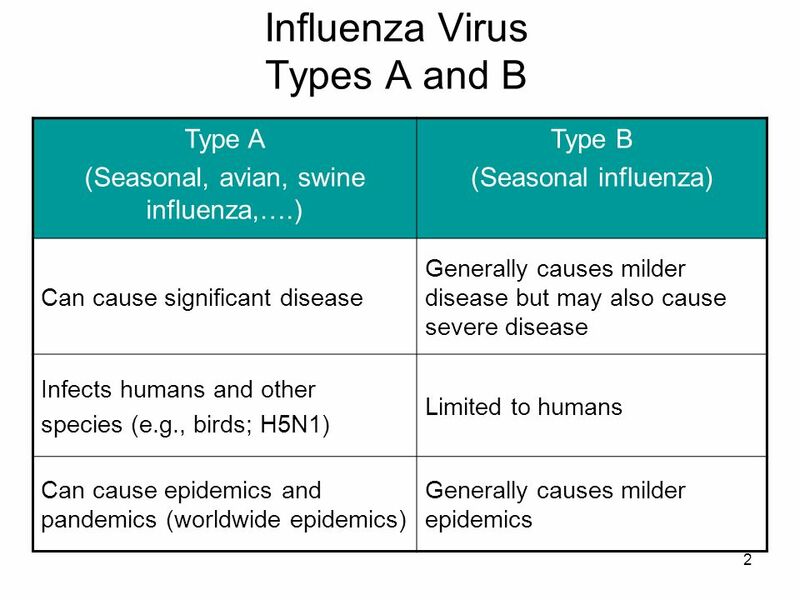 Type B (Seasonal influenza) Can cause significant disease Generally causes milder disease but may also cause severe disease Infects humans and other species (e.g., birds; H5N1) Limited to humans Can cause epidemics and pandemics (worldwide epidemics) Generally causes milder epidemics While there are three types of influenza viruses—A, B, and C—only two cause significant disease in humans (A and B). 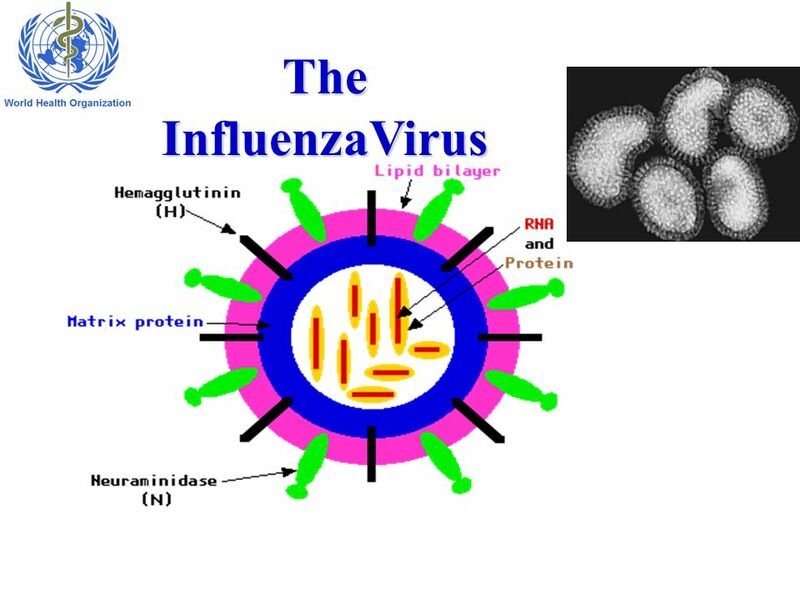 Type B influenza viruses are limited to humans, whereas Type A viruses can cause severe disease in humans and affect more species. 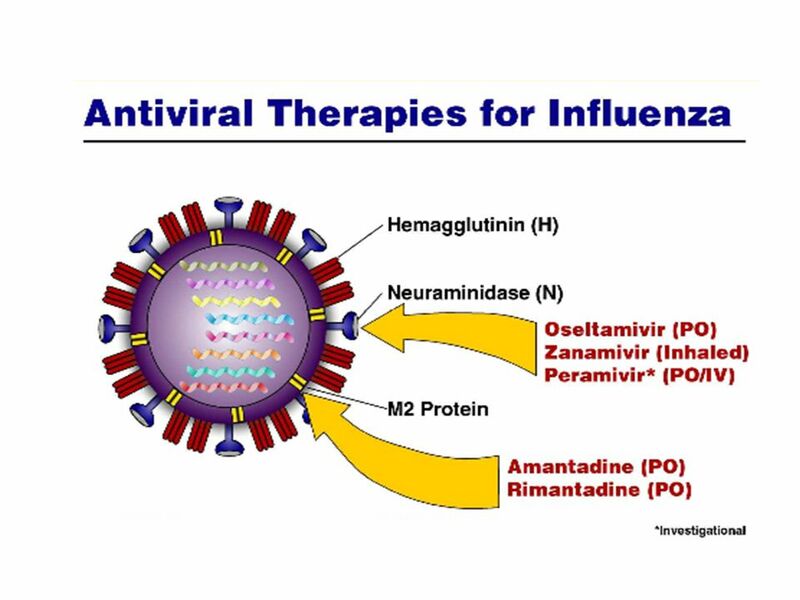 Influenza Type A Type A influenza is considered to cause the most serious disease among the influenza viruses, although not all strains cause clinical disease. 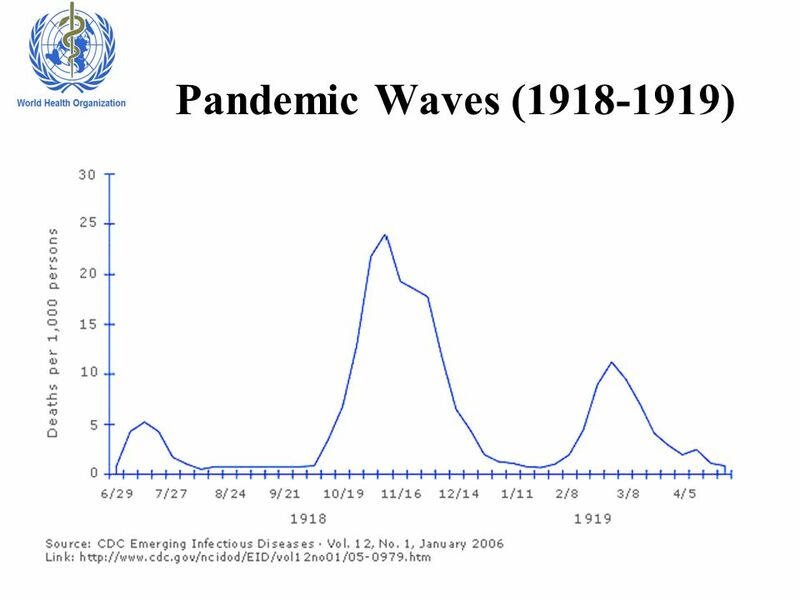 Influenza A can cause severe epidemics (as well as severe worldwide epidemics; or pandemics) among all ages. Influenza type A infects multiple species including people, birds, pigs, horses, and other animals. Wild birds are the natural hosts for these viruses. 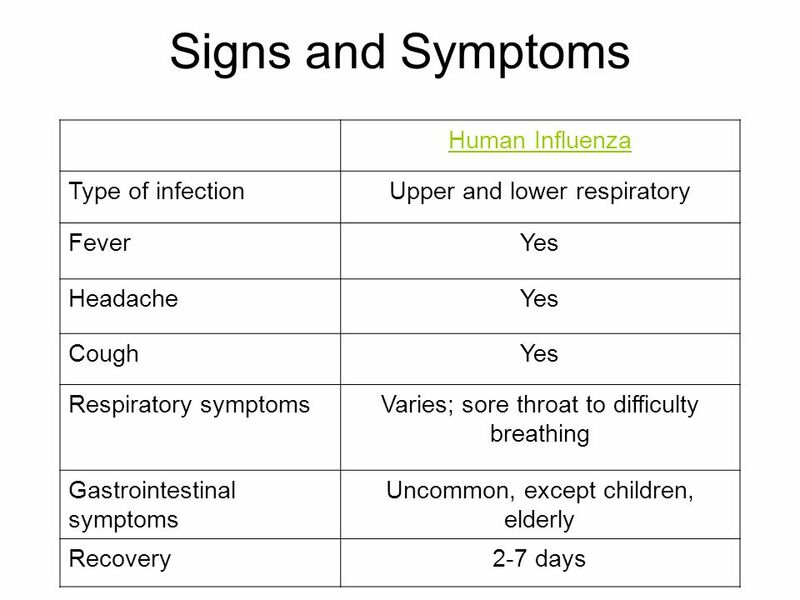 Influenza Type B Influenza B viruses are usually found only in humans. Influenza B viruses can cause some morbidity and mortality among humans, but in general are associated with less severe epidemics (chiefly among children) than influenza A viruses. 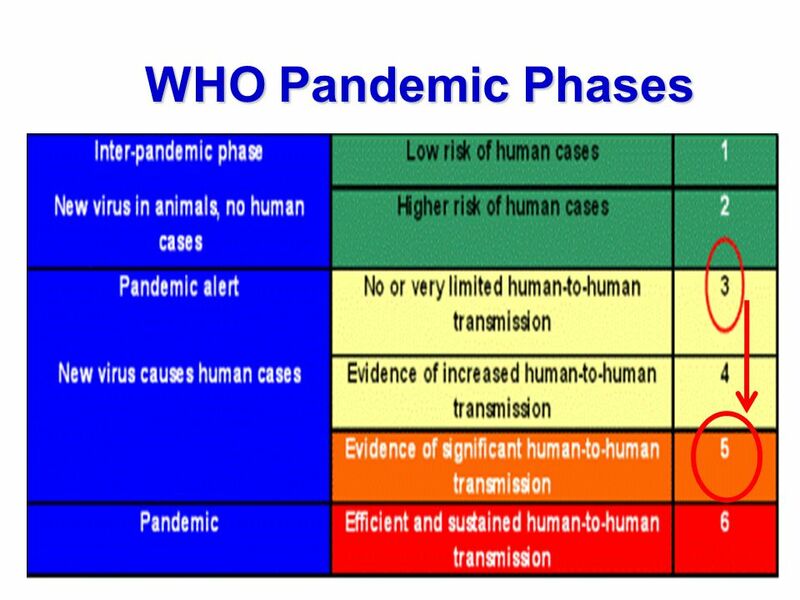 Although influenza type B viruses can cause human epidemics, they have not caused pandemics. Because avian influenza and all pandemic viruses are of the Type A variety, we will focus this session on Type A influenza viruses. Seasonal Influenza A public health problem each year Usually some immunity built up from previous exposures to the same subtype Infants and elderly most at risk Influenza Pandemics Appear in the human population rarely and unpredictably Human population lacks any immunity All age groups, including healthy young adults While seasonal influenza occurs every year, pandemic influenza rarely occurs. 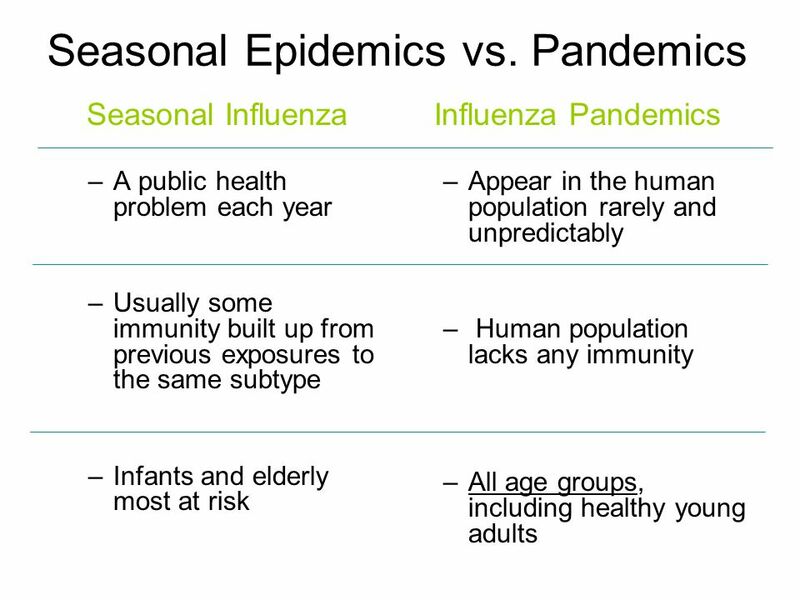 Here we compare some features of seasonal influenza with features of pandemic influenza. 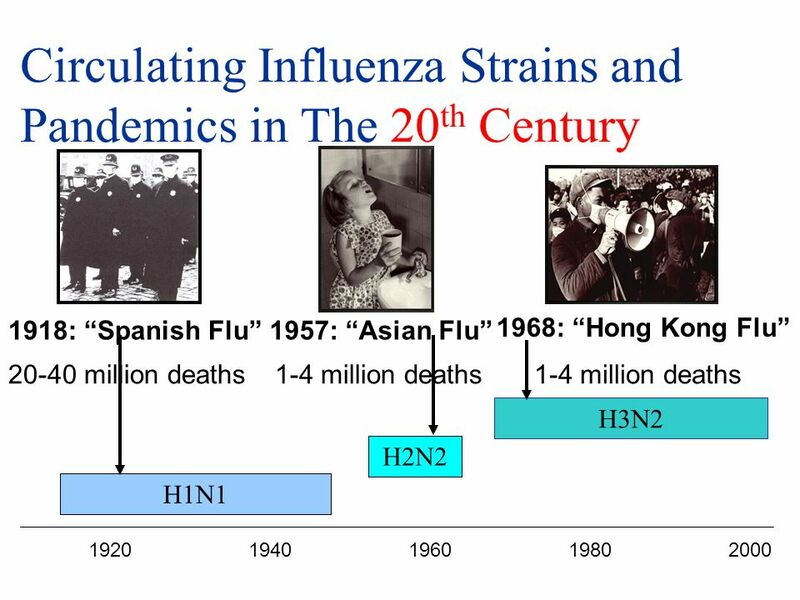 While the population usually has some immunity built up from previous exposures to seasonal influenza, the human population lacks any immunity to pandemic influenza strains. In seasonal influenza epidemics, infants and the elderly are most at risk of illness and complications. 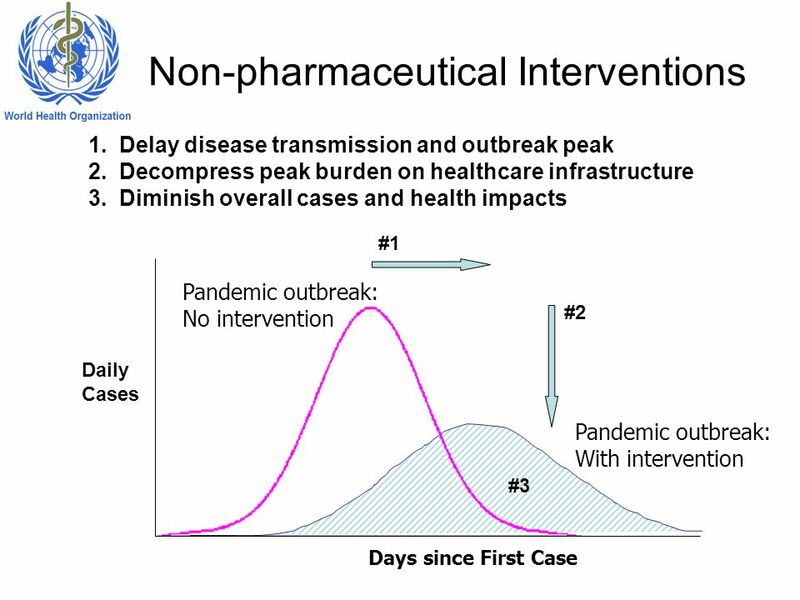 But during an influenza pandemic, even healthy, young people are at increased risk for serious complications. 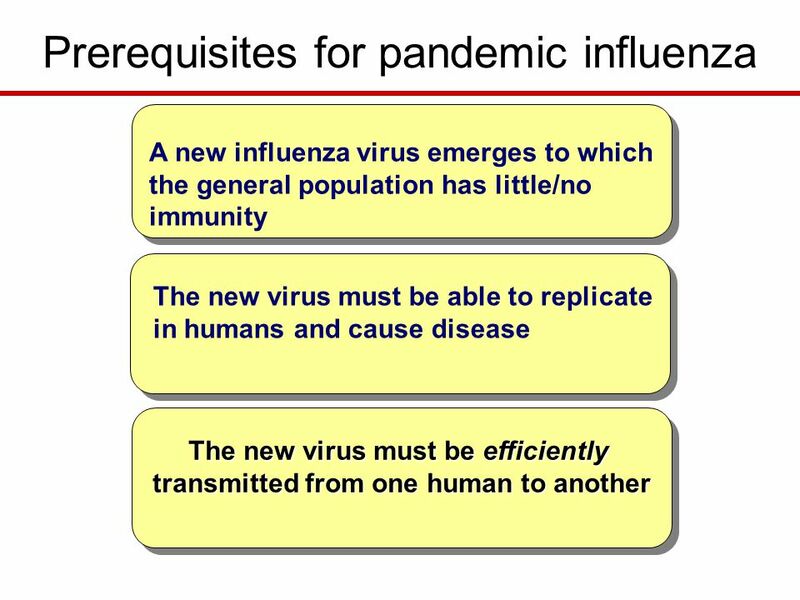 Seasonal influenza strains are the result of Antigenic Drift, while pandemic influenza strains are the result of Antigenic Shift. 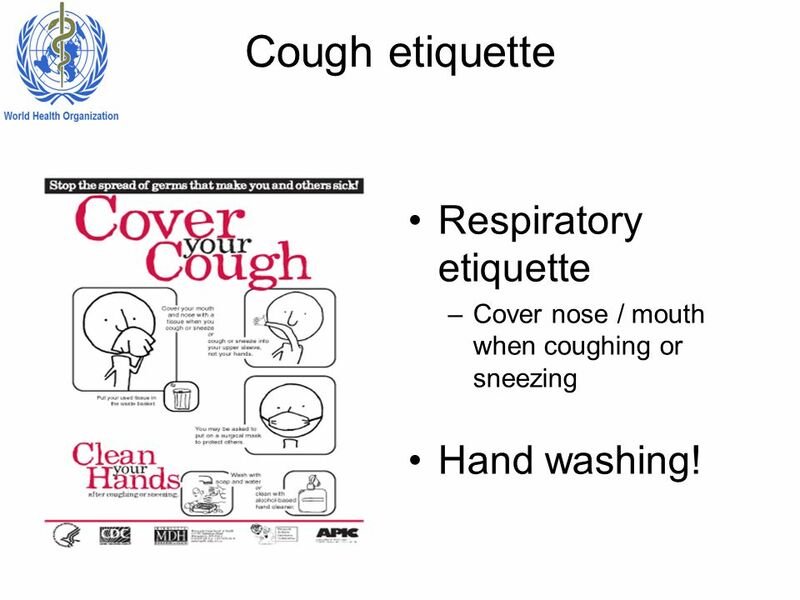 15 Cough etiquette Respiratory etiquette Hand washing! 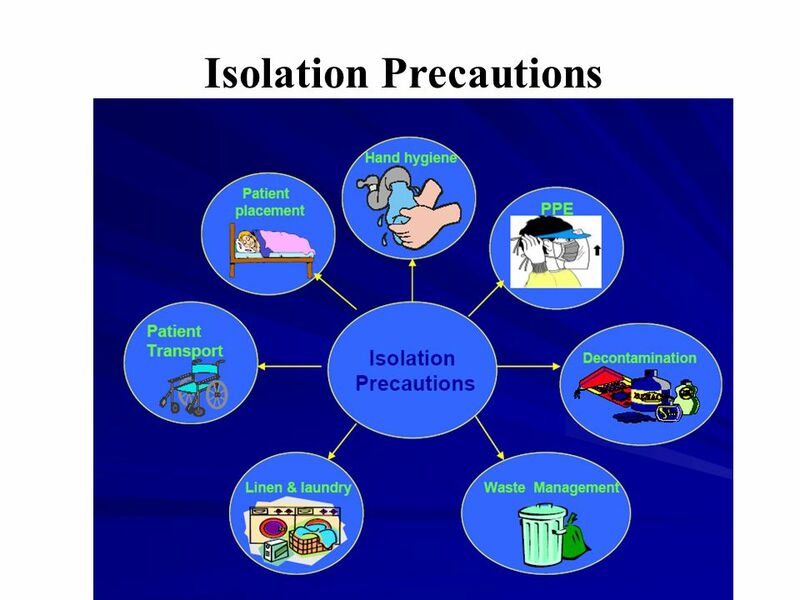 Rub hands together for at least 20 seconds Rinse with clean water Dry with disposable towel or air dry Use towel to turn off faucet While not formally a type of PPE, we will first discuss hand hygiene, because it is the cornerstone of infection control! Always remember to wash hands in between contact with each new patient. 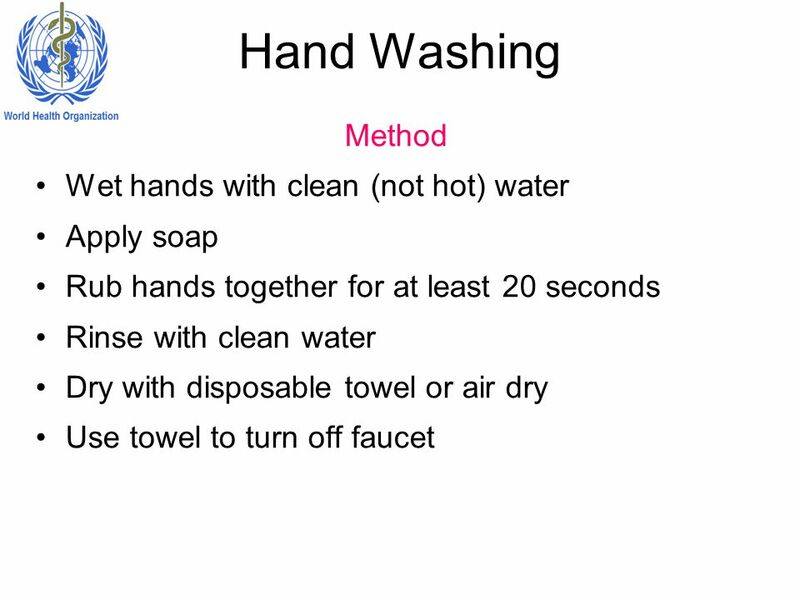 This slide describes effective hand hygiene techniques: When washing hands with soap and water, first wet hands with water, then apply the amount of soap recommended by the manufacturer. Rub hands together for at least 20 seconds, covering all surfaces of the hands and fingers. Rinse hands with water, dry them thoroughly with a disposable towel, and use the towel to turn off the faucet. Of course, this assumes that clean water is available. If there is any doubt about this, boiled or bottled water, or water treated with chlorine tablets should be used. 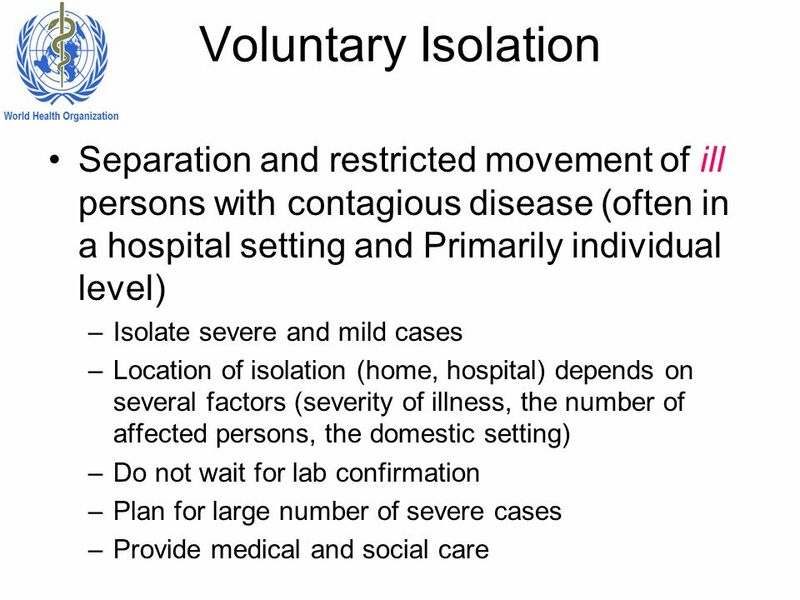 *Source: Guideline for Hand Hygiene in Health-care Settings. MMWR 2002; vol. 51, no. RR-16. 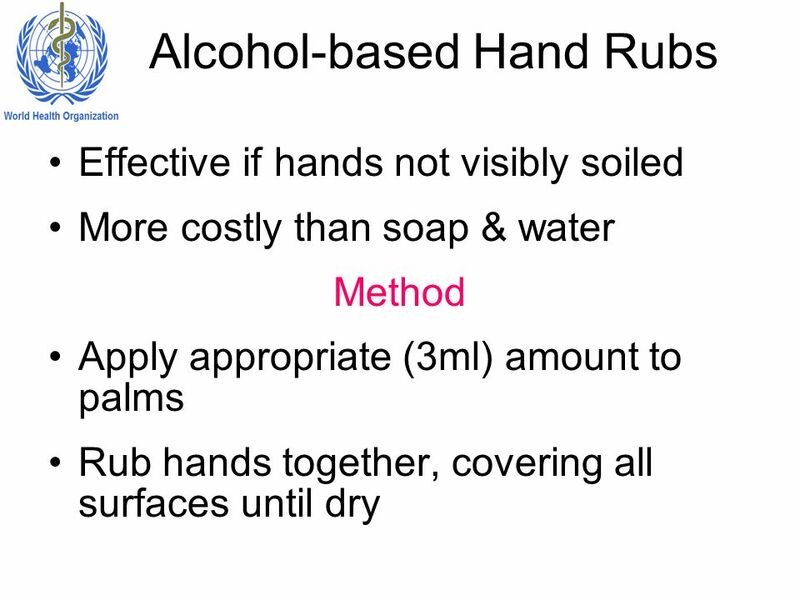 Effective if hands not visibly soiled More costly than soap & water Method Apply appropriate (3ml) amount to palms Rub hands together, covering all surfaces until dry If hands are not visibly soiled, alcohol-based hand cleaners are also effective. 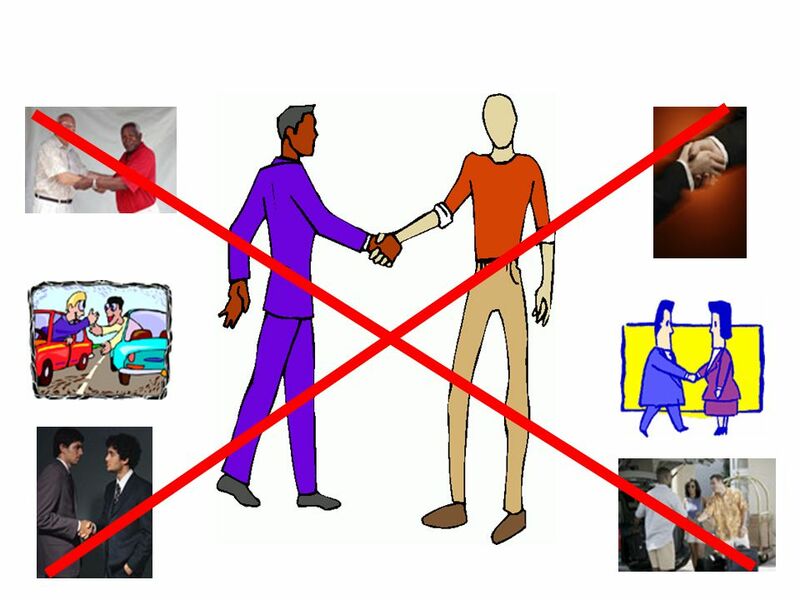 When decontaminating hands with an alcohol-based hand rub, apply product to palm of one hand and rub hands together, covering all surfaces of hands and fingers, until hands are dry. The volume to use depends on the manufacturer directions, but usually a coin-sized amount in your hand is sufficient. 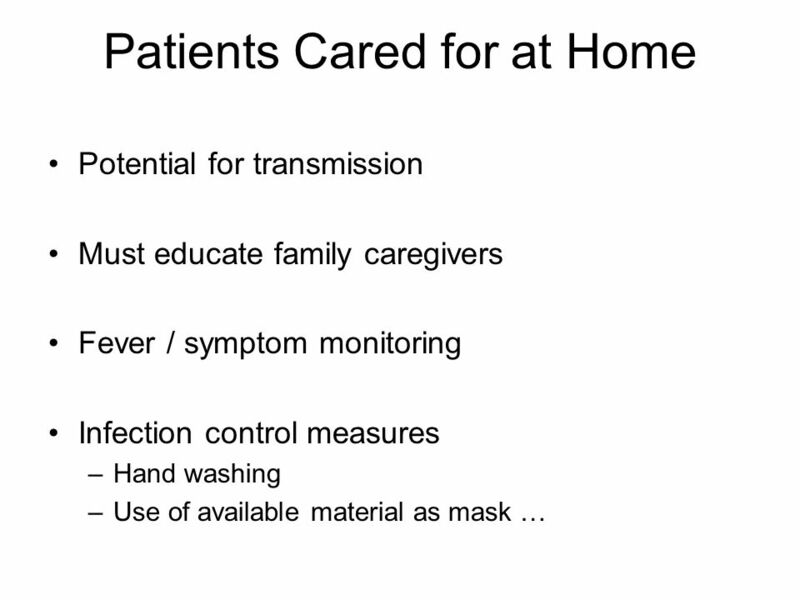 Potential for transmission Must educate family caregivers Fever / symptom monitoring Infection control measures Hand washing Use of available material as mask … As with any infectious disease, there is the potential for avian influenza to be transmitted in the home. 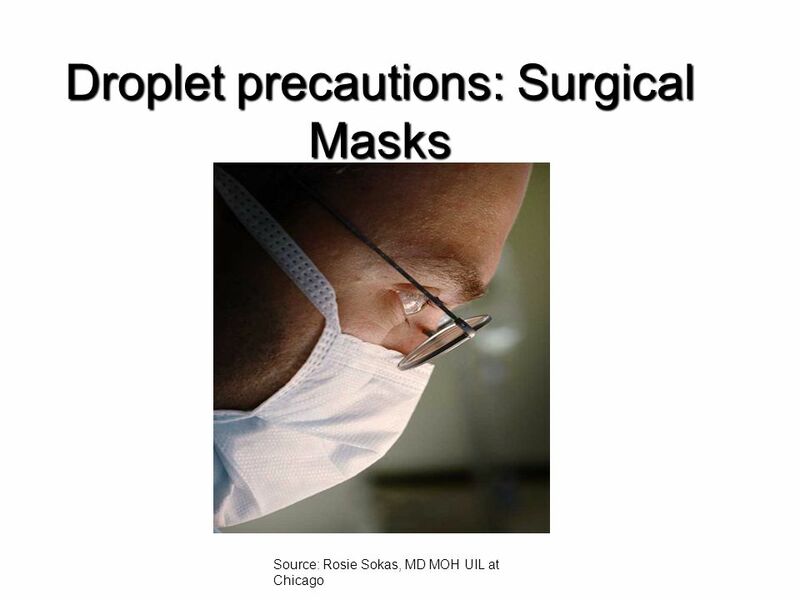 Therefore, people within the home of an infected individual should be educated on the risk for transmission, and ideally wear personal protective equipment including gloves, gowns and surgical masks. 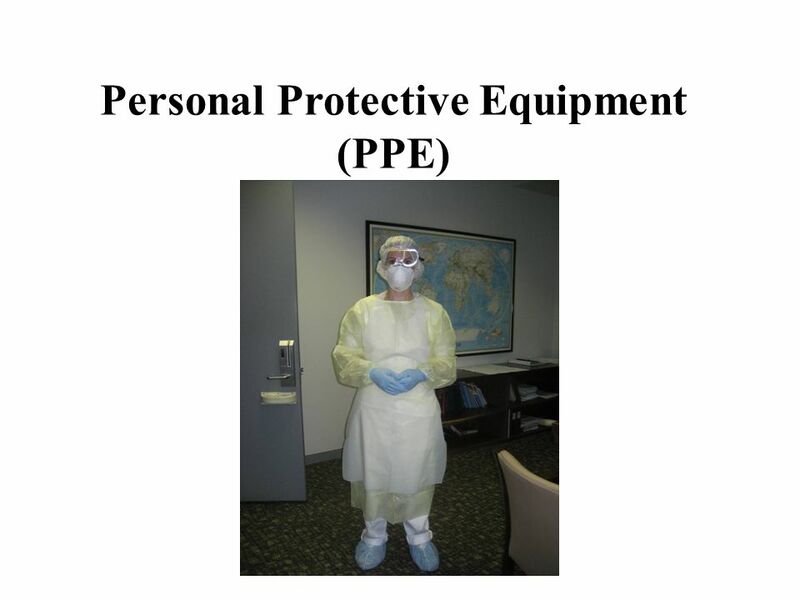 If PPE items are unavailable, readily available materials such as tissues or cloths should be used. And hand hygiene, as always, is critically important in preventing the spread of avian influenza in the home. Finally, as will be discussed in a moment, anyone handling corpses should wear protective gear. 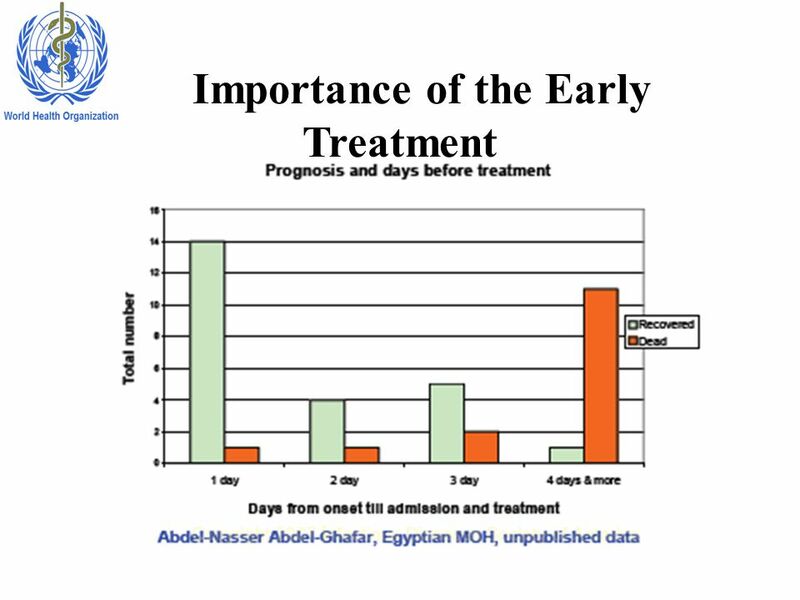 Treatment is 75 mg twice a day for 5 days. Prophylaxis is 75 mg once a day for 7 days after last exposure. 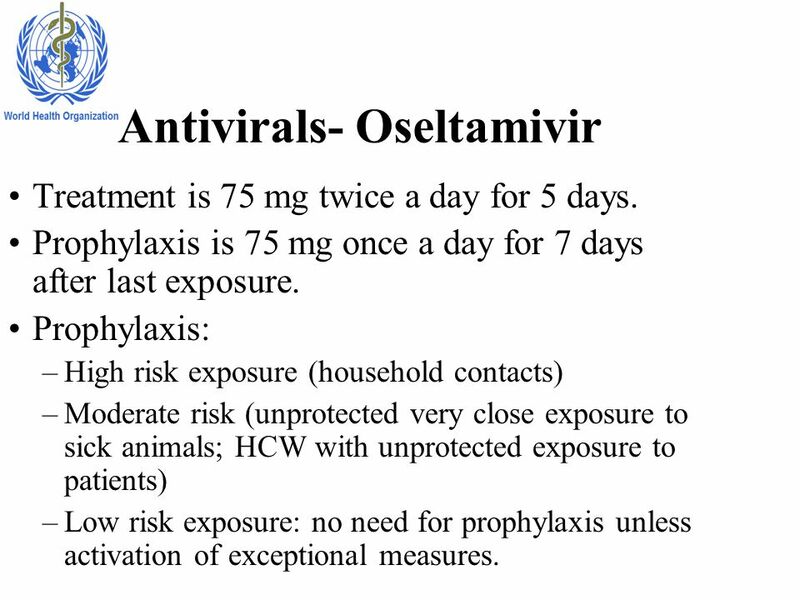 Prophylaxis: High risk exposure (household contacts) Moderate risk (unprotected very close exposure to sick animals; HCW with unprotected exposure to patients) Low risk exposure: no need for prophylaxis unless activation of exceptional measures. 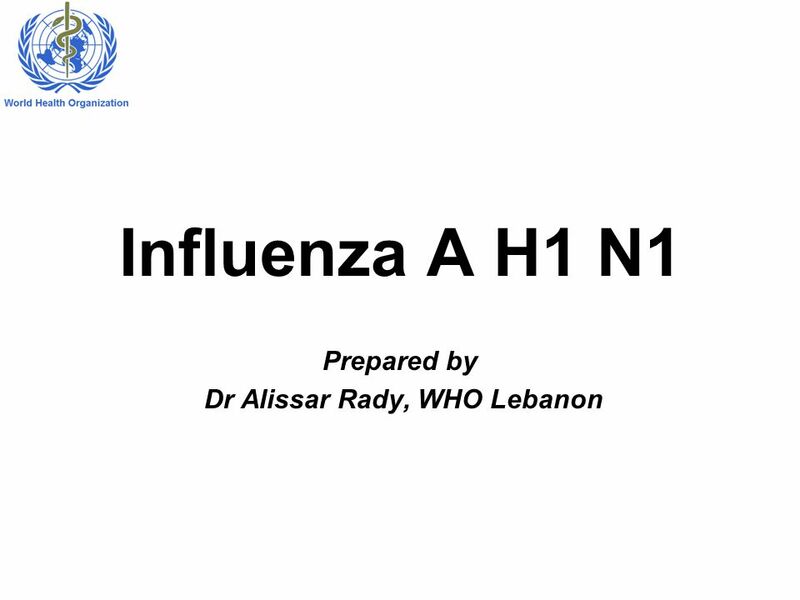 Download ppt "Prepared by Dr Alissar Rady, WHO Lebanon"
C E N T R A L P I E D M O N T C O M M U N I T Y C O L L E G E Pandemic and Influenza: A Guide to Understanding. Swine Flu H1N1 Pls Take Care … Darshan …. 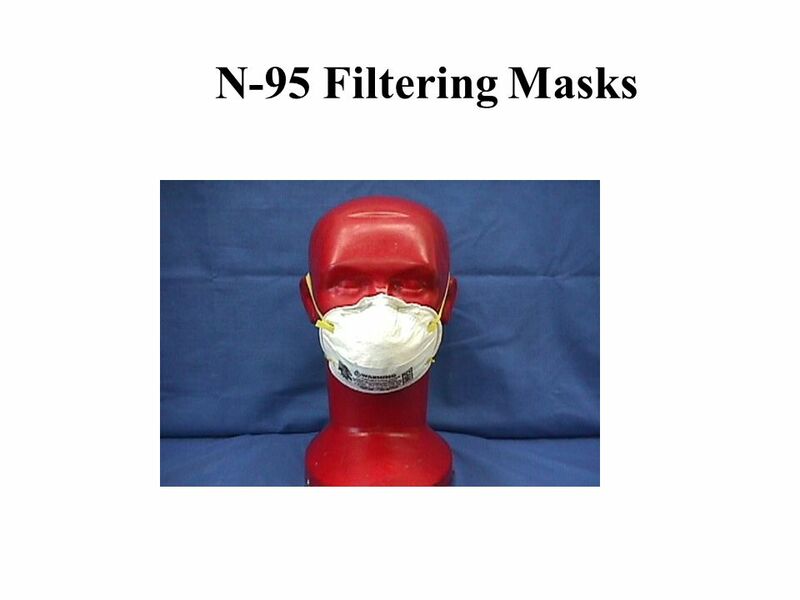 1 Avian Influenza Bird Flu H5N1. 2 Avian Influenza… Is a respiratory illness in birds Wild birds and ducks are the natural reservoir for infection, though. Pandemic Flu Preparedness and Awareness. What is Flu and Pandemic Flu What is flu? Flu, also called influenza, is a contagious disease of the lungs and. 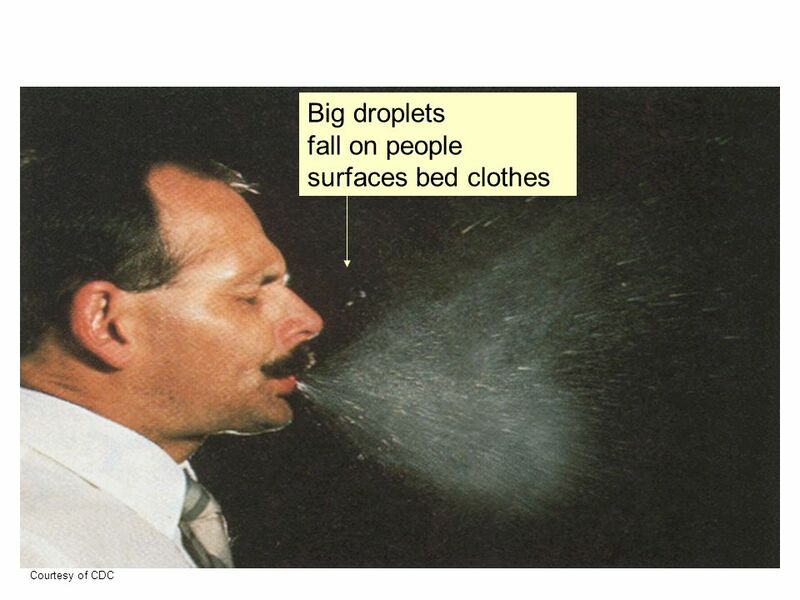 Source: New Jersey Hospital Association Copyright 2000, New Jersey Hospital Association Pandemic Impact Valerie Sellers Senior Vice President Health Planning. Dr S Aboobakar Regional Public Health Superintendent. 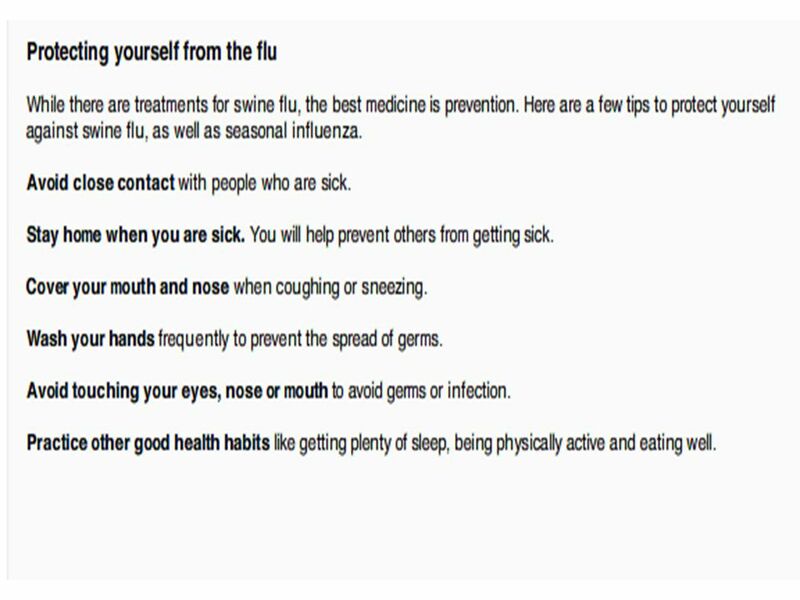 Influenza A, H1N1 “Swine Flu” The Facts and How to Protect Yourself. Influenza Prevention We anticipate that there will be two types of influenza illness and influenza vaccines this year Seasonal influenza – the usual flu. NH Department of Health and Human Services Division of Public Health Services Influenza Seasonal and H1N1 Patricia Ingraham, MPH Communicable Disease Control. Safer, fairer and more productive workplaces Pandemic influenza Patricia Coward Principal Adviser (Occupational Health) Occupational Health Unit (07) 3247. 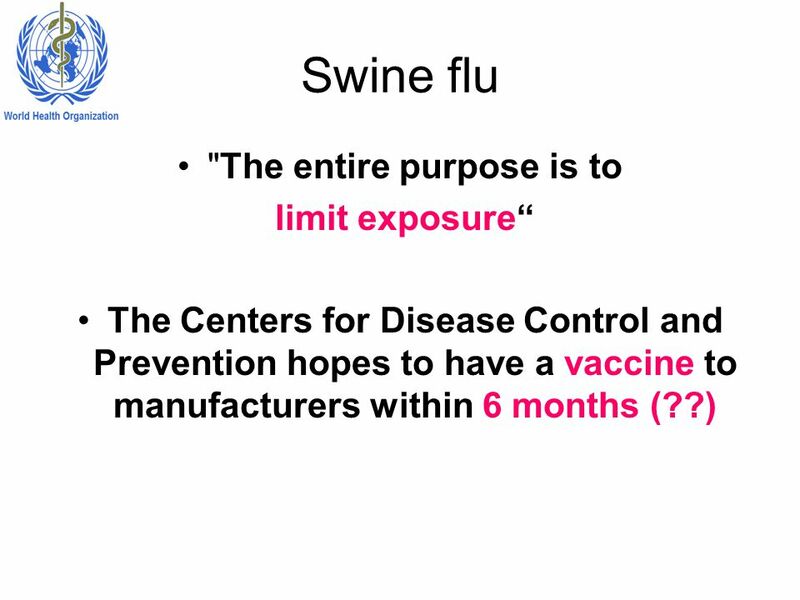 Swine Influenza (pig flu) is a respiratory disease of pigs caused by type A influenza virus that regularly causes outbreaks of influenza in pigs. Swine. 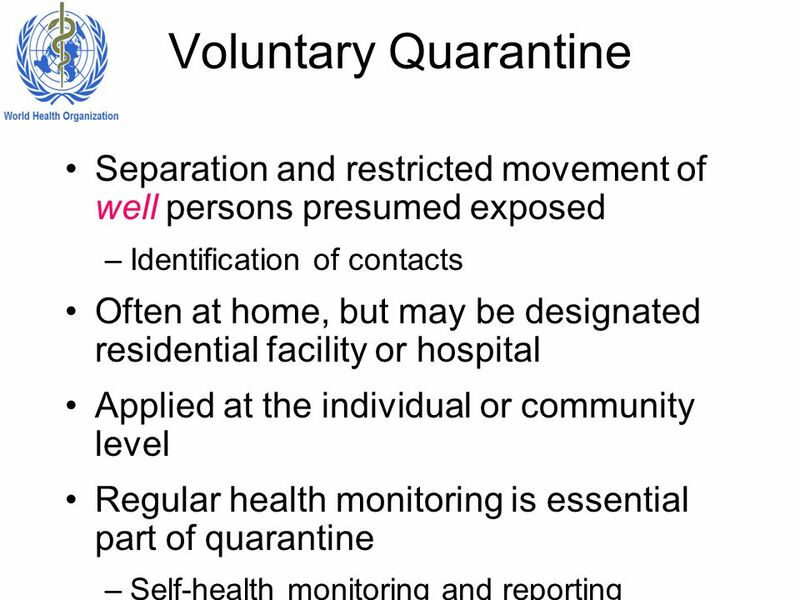 Influenza A (H1N1) Virus & Pandemic Preparedness Generic H1N1 presentation developed for UN staff by Dr. Esther Tan, MSD, UNNY (Please customize. 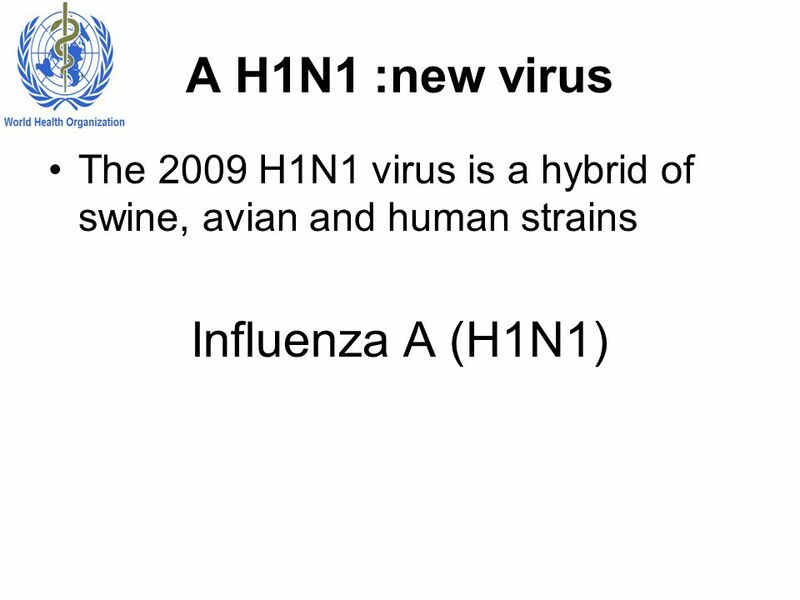 INFLUENZA A H 1 N 1 R P VASHIST,M.D. HEAD PUBLIC HEALTH.